Rating and Review themes are great in that they allow your visitors to rate and leave comments about products or services showcased on your website. Search engines such as Google and Yahoo love these sites because with reviews and comments it always offer fresh content. Users will love the site because they see ratings and they are active participants in your site. With these review and ratings WordPress themes and Joomla Templates you can easily create a reviews site for games, software, computers, applications, iphone apps, movies, restaurants and more. This is a dynamic list so check back often to see what new rating and reviews themes are out on the market. 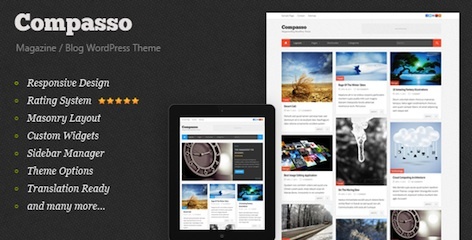 Compasso is a elegant and professional WordPress theme from Themeforest. Compasso features scrolling featured articles, Ratings & Reviews module, responsive design, sidebar manager, tons of shortcodes, easily add google maps, theme options to easily customize your magazine site, posts lists, posts grid format, social media integrated, integrate Twitter feeds, integrate Flickr feeds, SEO optimized and more. You can use Compasso to create a magazine or news website. Startup cost to create a responsive magazine site is less than $100, I’ve listed the cost breakdown below. You also don’t need any programming knowledge. Click here to see more features of Compasso Magazine WordPress Theme. 3. $45 for Wordpress Theme. This is a one time fee to purchase Compasso from Themeforest. Once you download the theme it totally belongs to you. There are no membership fees, no hidden fees and no subscription fees. Mommy&Me is a professional WordPress Theme by Magazine 3 that has bold colors, customizable backgrounds, easily change the logos, easily add new categories, ratings & reviews, advanced menu management, tons of ad placements, responsive design and more. You can see from the Mommy&Me WordPress demo below that the WordPress Theme allows you to focus on creating interesting content for your viewers. The WordPress Theme does all the rest of the work. You don’t need any programming knowledge and Magazine3 even does free installation. All features are built into this theme. The startup cost to create a professional mom’s blog will be less than $100. I’ve listed the cost breakdown below. Click here to see more features of Mommy&Me Mommy Blog WordPress Theme. 1. $56 for Webhosting. To create your own Professional Mom’s Blog Website, you will first need a domain name. That’s why I recommend Fatcow.com. When you purchase web hosting from Fatcow, you get a free domain name. Along with that you also get unlimited email, disk space, bandwidth, MySQL databases, host unlimited domains and more. Click here to immediately save 40% off at Fatcow.com. 3. $69 for Wordpress Theme. This is a one time fee purchase Mommy&Me from Magazine 3. There are no membership fees no subscription fees and no hidden fees. Once you download the theme it totally belongs to you. 4. -$175 in Advertising Credits. If you purchase your webhosting from Fatcow.com you get free $175 worth of advertising credits. Fatcow.com understands it’s difficult to advertise your Mom’s Blog Site and so they give you free advertising credits, this includes $100 for Google Adwords, $50 Facebook ads, and $25 for Yahoo/Bing. So you actually don’t pay anything to startup a Mom’s Blog. 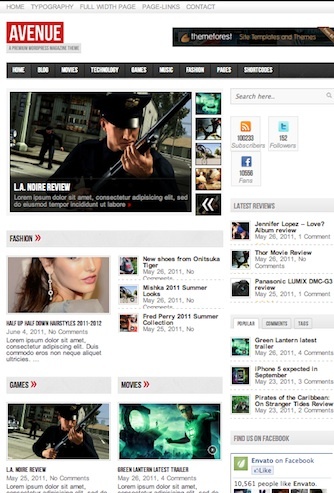 GamingZone is a WordPress Theme designed to make your website look professional and gain maximum exposure to your content. It’s created by Magazine3 and they provide you with help and support to setup your Game Review website. They even help you install your WordPress Theme for free. You basically just have to start adding content because there is no programming knowledge required. GamingZone features star ratings with star rating subcategories, SEO optimization, innovative thumbnail type, responsive design, 10 different ad placements, Adsense ready, advanced menu management, admin control panel to customize all aspects of your site, social media integrated and tons more features. 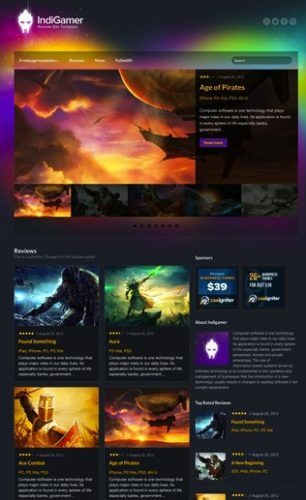 You can easily use this WordPress Theme to create a Game review site, Game Magazine website, Gaming portals, or any professional gaming website or gaming blog. Cost to make a game review site with WordPress is less than $100. I’ve listed the cost breakdown below. Click here to see more features of GamingZone. 1. $56 for Webhosting. 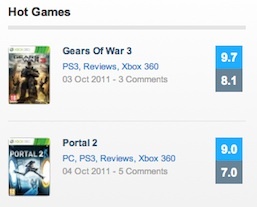 To create your own Game Review Website, you will first need a domain name. That’s why I recommend Fatcow.com. When you purchase web hosting from Fatcow, you get a free domain name. Along with that you also get unlimited email, disk space, bandwidth, MySQL databases, host unlimited domains and more. Click here to immediately save 40% off at Fatcow.com. 3. 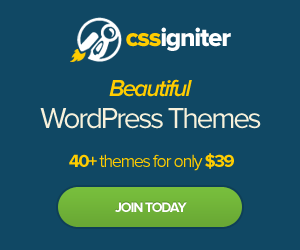 $49 for Wordpress Theme. This is a one time fee purchase GamingZone from Magazine3. There are no membership fees no subscription fees and no hidden fees. Once you download the theme it totally belongs to you. 4. -$175 in Advertising Credits. If you purchase your webhosting from Fatcow.com you get free $175 worth of advertising credits. Fatcow.com understands it’s difficult to advertise your Game Review Site and so they give you free advertising credits, this includes $100 for Google Adwords, $50 Facebook ads, and $25 for Yahoo/Bing. So you actually don’t pay anything to startup a Game Review Clone. 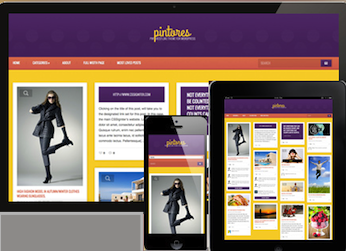 Startup cost to create a pinterest-like or tumblr-like site with WordPress Theme – Pintores is less than $100. I’ve listed the cost breakdown below. 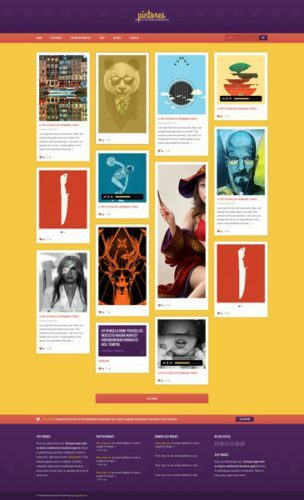 Pintores is a stylish, colorful and modern Pinterest-like & Tumblr-Like WordPress Theme by Cssigniter. 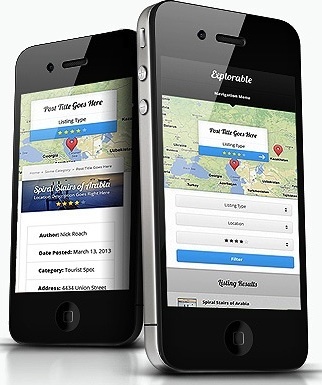 This theme is fully responsive to serve a better experience for your mobile visitors. Content will automatically wrap to fit a tablet, smartphone, or computer screen. You can create multiple post formats just like a Tumblr blog site, you can create a post for Music tracks, videos, images, photo galleries, quotes, links and normal posts. Pintores has a unique ratings and review module. Each post has a heart icon, comments icon and link icon. Visitors can click on the heart icon to like a post, it will list how many people clicked on the button. Visitors can also write reviews and comments on each post, you will see how many comments were made at the bottom of the post. Other features include unlimited color variations, advanced theme options, custom menus, SEO optimized and more. Click here to see more features of Pintores. 1. $56 for Webhosting. To create your a Pinterest-like Website, you will first need a domain name. That’s why I recommend Fatcow.com. When you purchase web hosting from Fatcow, you get a free domain name. Along with that you also get unlimited email, disk space, bandwidth, MySQL databases, host unlimited domains and more. Click here to immediately save 40% off at Fatcow.com. 3. $39 for Wordpress Theme. This is a one time fee to join the Cssigniter Theme club. Once you are a member, you will have unlimited access to download themes and support forums. 4. -$175 in Advertising Credits. If you purchase your webhosting from Fatcow.com you get free $175 worth of advertising credits. Fatcow.com understands it’s difficult to advertise a Pinterest-like Site and so they give you free advertising credits, this includes $100 for Google Adwords, $50 Facebook ads, and $25 for Yahoo/Bing. So you actually don’t pay anything to startup a Pinterest-like Website. 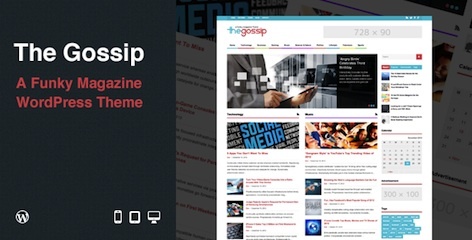 Create a modern and funky magazine site with WordPress and WordPress Theme – The Gossip. The Gossip is an ultra-wide, modern and fully responsive WordPress Theme that can be used for any type of magazine or news website. The great thing about The Gossip Theme is that it makes use of space on wider screens and resizes all the way down to a mobile site. You can also allow your visitors to use a star rating system to rate and write a review about your posts. You can use The Gossip WordPress Theme to create a News site, Gossip Magazine Site, Site like PerezHilton, Site like TechCrunch, Site like Mashable, Sports Magazine, or any other content focused website. Click here to see more features of The Gossip. 2. $0 for WordPress. Wordpress is completely free open source platform. Fatcow has one click installs for WordPress and if you use that to install WordPress, you will have WordPress installed in minutes. 3. $55 for WordPress Theme. This is a one time fee to purchase The Gossip from Themeforest. After you download the theme, it totally belongs to you. There are no subscription fees, no membership fees and no hidden fees. So you actually don’t pay anything to startup your Magazine Website. I really like this Magazine WordPress Theme. The full screen allows you to put more content on your magazine site. Not many magazine sites have a rating and reviews module built in, and this one does. It allows you to have your visitors interact with you and other viewers of your website. You can also install BuddyPress and this Magazine website will transform into a social networking platform like Facebook. You can also install WooCommerce and your site will transform into an online store. This is an amazing Magazine WordPress Theme that is extremely versatile and can be used for any purpose. Cost to create your own knowledge base website with WordPress and WordPress Theme is less than $100. I’ve listed the cost breakdown below. You definitely do not require any programming knowledge because everything about WordPress is plug and play. You simply install WordPress, upload and activate WordPress Theme – iKnowledge and you instantly have a website transformed into a knowledge base system. iKnowledge WordPress Theme has tons of features include responsive design, ratings & reviews, Twitter integrated, Facebook integrated, shortcodes, translation ready and tons more. Click here to see more features of iKnowledge. 1. $56 for Webhosting. To create your own Wiki Website, you will first need a domain name. That’s why I recommend Fatcow.com. When you purchase web hosting from Fatcow, you get a free domain name. Along with that you also get unlimited email, disk space, bandwidth, MySQL databases, host unlimited domains and more. Click here to immediately save 40% off at Fatcow.com. 3. $45 for Wordpress Theme. This is a one time fee to purchase iKnowledge WordPress Theme from Themeforest. After you download the theme, it totally belongs to you. There are no subscription fees, no membership fees and no hidden fees. 4. -$175 in Advertising Credits. If you purchase your webhosting from Fatcow.com you get free $175 worth of advertising credits. Fatcow.com understands it’s difficult to advertise your Wiki Site and so they give you free advertising credits, this includes $100 for Google Adwords, $50 Facebook ads, and $25 for Yahoo/Bing. So you actually don’t pay anything to startup your Wiki Website. iKnowledge is a great WordPress Theme to create your own Ratings & Reviews Knowledge Base System. Team members can easily add their own documentation. You can create multiple categories with unlimited number of documentation. Users can rate the articles just like you see in the Microsoft knowledge bases, Google help documents or Yahoo help documents. Visitors can rate and write reviews on the documents created as feedback to the usefulness of the articles on your knowledge base site. You can also track the popularity of the help documents via the article counter. I think this is an amazing WordPress Theme to easily transform your WordPress site into a professional and fully functional knowledge base website. Review websites are popular because consumers want to read yours and other people’s opinion before purchasing a product. I recommend using WordPress and WordPress Theme Review Template – Rethink. Wordpress is extremely easy to use, easy to maintain, easy to create new reviews and easy to install and activate new WordPress Themes. With Rethink WordPress Theme you can instantly transform your WordPress blog into a professional Review website. You don’t even need any programming knowledge and startup cost will be less than $100. I’ve listed the cost breakdown below. With this WordPress Theme you can create a review website for cars, review websites for electronic devices, review websites for cameras, review websites for watches, review websites for movies, review websites for services and more. Rethink WordPress Theme features responsive design, scrolling featured reviews, star ratings, Overall Star Rating, Product Review page, category star ratings, product portfolio and more. Click here to see more features of Rethink. 1. $56 for Webhosting. To create your own Review Website, you will first need a domain name. That’s why I recommend Fatcow.com. When you purchase web hosting from Fatcow, you get a free domain name. Along with that you also get unlimited email, disk space, bandwidth, MySQL databases, host unlimited domains and more. Click here to immediately save 40% off at Fatcow.com. 3. $45 for Wordpress Theme. This is a one time fee to purchase Rethink WordPress Theme Review Template from InkThemes. Once you purchase you can download it and the theme totally belongs to you. There are no membership fees, no hidden fees and no subscription fees. You also get lifetime support and updates for this theme. 4. -$175 in Advertising Credits. If you purchase your webhosting from Fatcow.com you get free $175 worth of advertising credits. Fatcow.com understands it’s difficult being a new Review Website and so they give you free advertising credits, this includes $100 for Google Adwords, $50 Facebook ads, and $25 for Yahoo/Bing. So you actually don’t pay anything to startup your Review Site. With WordPress Themes you can immediately convert your plain blog into a professional Review site in minutes. Wordpress is easy to use, easy to maintain, easy to upgrade, easy to create new review posts. 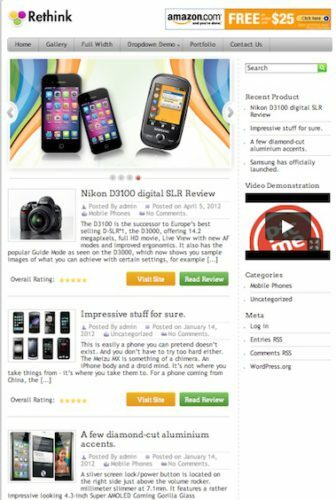 You can easily use Rethink WordPress theme to create product reviews, review them, rate them and more. If you want to test out the responsive design, you can demo the WordPress Theme and resize the window. You will see the content automatically wrap to fit the screen. This is especially useful if you have users visiting your site using an iPad, iPhone, tablets, or any smartphone devices. Overall this is a great Review Template to create any review website you want. Cost to make a recipe website with WordPress and WordPress Theme – Petit is less than $100. With WordPress you do not need to know any programming knowledge. Your webhosting should install WordPress in minutes and installing & activating WordPress Themes is a breeze. You will have your Recipe Website framework up in a few hours. Petit has a fully responsive design, scrolling features images, image links and short details about other delicious dishes you have, unlimited categories, star ratings & reviews, ingredient list, cooking / baking instructions and more. 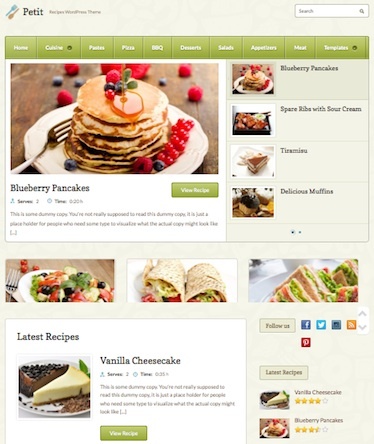 Petit WordPress theme has everything you need to create your own recipe website. Click here to see more features of Petit. 1. $56 for Webhosting. To create your own Recipe Website you will first need a domain name. That’s why I recommend Fatcow.com. When you purchase web hosting from Fatcow, you get a free domain name. Along with that you also get unlimited email, disk space, bandwidth, MySQL databases, host unlimited domains and more. Click here to immediately save 40% off at Fatcow.com. 3. $69 for WordPress Theme. This is a one time fee to purchase Petit WordPress Theme from WPZoom. Purchase a theme and you can download another theme for free. There are no hidden fees, no membership fees and no subscription fees. I think this is a great deal to create your own recipe site. 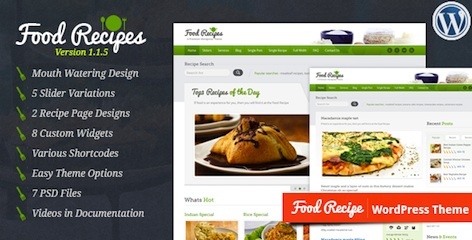 This is a great WordPress Theme to create your own cooking or baking recipe website. I love that the site is very simple and organized. You can place many pictures around the site. There are scrolling featured images that capture the audiences attention right away. You can show your latest recipes, share images from instagram, share recipes on facebook, share on twitter. In the individual recipe page you can see the cooking time, number of servings, required ingredients, instructions on how to bake or cook, images, latest recipes, related recipes and more. I just love everything this WordPress theme has to offer. 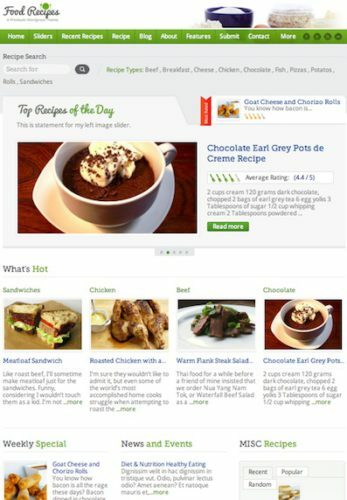 It’s the perfect WordPress Theme to create an amazing Recipe Website. Cost to create a professional Business Website with Joomla 3.0 Template – Brisk will be less than $100. Below is the cost breakdown. Joomla 3.0 Template – Brisk has a responsive design, scrolling featured articles, display sponsors at the bottom, call to action buttons, Ratings and Reviews, T3v3 Framework, layout configure, thememagic and more. Click here to see more features of Brisk Joomla 3.0 Template. 1. $56 for Webhosting. First step to build your own Business Website is to purchase a domain name and then webhosting. Fatcow offers a free domain name with purchase of webhosting. Right there, that’s a savings of $12/year. If you purchase web hosting from Fatcow.com, you also get unlimited emails, unlimited bandwidth, unlimited MySQL databases and more. Right now Fatcow has a 40% off sale, I would take advantage of this now. Click here for more details about Fatcow.com. 3. $59 for Joomla 3.0 Template. This is a one time fee to join Joomlart Standard Membership for three months. You can download as many Joomla Templates as you want including Brisk. You will have full access to their email and theme support forum. There are no other hidden fees and no subscription fees. 4. -$175 in Advertising Credits. Fatcow understands it’s difficult to get your Business Website noticed and helps you with advertising your website on respective search engines and social networking platforms. So Fatcow gives you for free $100 in Google Adwords credits, $50 in Facebook Ad credits and $25 in Yahoo/Bing Adcenter credits. I think this is a very professional Joomla 3.0 Template to create any technology website. It would be great for a business that requires people to download software. It’s pretty cool that you can easily create a pricing chart page to compare products in a chart format. You should play around with the Joomla 3.0 Template and check out all the features through the demo. Startup costs to create your own YouTube Clone is less than $100. Use WordPress, install and activate WordPress Theme VideoCraft. Wordpress is extremely easy to use, easy to create posts, easy to manage your website, easy to change WordPress Themes and SEO optimized. I’ve listed the cost breakdown below. This Video Sharing WordPress Theme has tons of features including User Registration Module, Responsive, Video Upload Module, Ratings & Reviews, Embed Videos through URLS from Youtube, Vimeo, MetaCafe, DailyMotion, and more. Click here to see more features of VideoCraft. Custom Widgets in Sidebar and Footer so you can place Ads, Images, Videos or any other Texts you like to have. 1. $56 for Webhosting. First step to create your own Youtube website is to purchase a domain name. But these days you can purchase the domain name and web hosting together to save costs. If you purchase web hosting from Fatcow.com, you get a free domain name, unlimited emails, unlimited bandwidth, unlimited MySQL databases and more. Right now Fatcow has a 40% off sale, I would take advantage of this now. Click here for more details about Fatcow.com. 3. $45 for WordPress Theme. This is a one time fee to purchase VideoCraft from InkThemes. There are no hidden fees, no subscription fees and no membership fees. 4. -$175 in Advertising Credits. Fatcow understands it’s difficult to get your Youtube Website visible and helps you with advertising your website on respective search engines and social networking platforms. So Fatcow gives you for free $100 in Google Adwords credits, $50 in Facebook Ad credits and $25 in Yahoo/Bing Adcenter credits. This is a great WordPress Theme to create your own video sharing website like Youtube. I love the user registration module where visitors can add their own videos. Visitors can watch the videos, rate the videos and leave comments. There is also a widget that will display the most popular videos on your website, the most recently uploaded video and related videos. You should check out the demo and play around with it. There are different colour schemes you can use as well. Startup cost to create your own website like Cnet.com with WordPress and WordPress theme is less than $100. You can create your own Ratings & Reviews Website easily by installing WordPress, downloading & Installing & Activating WordPress Theme Splash. Splash is a Ratings and Reviews Website designed to create a reviews website for electronics, iPhones, movies, iPads, tablets, games, services or anything you wish. 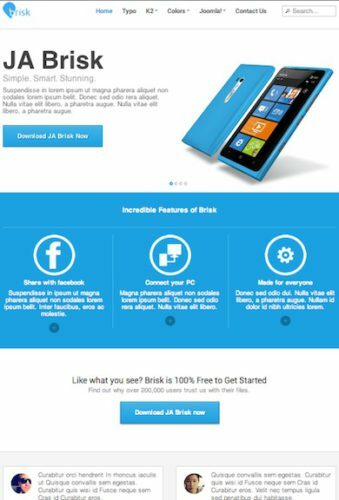 Splash has a responsive design with a fluid grid which means that device type or browser size is never an issue. It also has unlimited style schemes, flexible homepage layouts and more. Click here to see more features of Splash WordPress Theme. 1. $56 for Webhosting. First step to create your own Reviews website is to purchase a domain name. But these days you can purchase the domain name and web hosting together to save some costs. If you purchase web hosting from Fatcow.com, you get a free domain name, unlimited emails, unlimited bandwidth, unlimited MySQL databases and more. Right now Fatcow has a 40% off sale, I would take advantage of this now. Click here for more details about Fatcow.com. 3. $35 for WordPress Theme. This is a one time fee to purchase Splash from MyThemeShop. There are no hidden fees, no subscription fees and no membership fees. 4. -$175 in Advertising Credits. Fatcow understands it’s difficult to get your Reviews Website visible and helps you with advertising your website on respective search engines and social networking platforms. So Fatcow gives you for free $100 in Google Adwords credits, $50 in Facebook Ad credits and $25 in Yahoo/Bing Adcenter credits. I really love this Ratings and Reviews Website. It totally looks like CNet.com. If you look at the individual Product review, you can break down your star ratings i.e. give star ratings based on Cost, Clarity, Company, Service, Usability, Value, Userbility. You can further write reviews based on technical specs, features and upload a video about the product or service. You can upload images of the product and have a call to action button to visit the website. This is an amazing Ratings and Reviews Template to create your own Reviews website. I definitely recommend this WordPress Theme. Startup cost to make your own professional Newspaper website or magazine website is less than $100. You will be able to get your website framework up and running to start adding your content within a day if you use WordPress and WordPress Themes. The great thing about Newsletter from Themefuse is that the framework will auto-install the theme for you. Newsletter has tons of great features including Ratings & Reviews, Scrolling featured image, upload videos & images, social media integrated and more. Click here to see more features of Newsletter. One click installs – framework auto-installs the theme. 1. $56 for Webhosting. First step to create a newspaper or magazine website is to purchase a domain name. But these days you can get the domain name and web hosting together to save some costs. If you purchase web hosting from Fatcow.com, you get a free domain name, unlimited emails, unlimited bandwidth, unlimited MySQL databases and more. Right now Fatcow has a 40% off sale, I would take advantage of this now. Click here for more details about Fatcow.com. 2. $0 for Wordpress. With Fatcow there is free one click installs for WordPress. When you use the one click installs, you will have WordPress installed in minutes. This service is totally free from Fatcow. 3. $59 for Wordpress Theme. 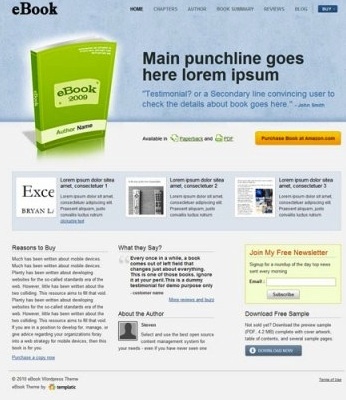 This is a one time fee to purchase Newsletter WordPress Theme from Themefuse. This includes license for a single domain, Detailed installation guide on how to use this theme and unlimited support via their online forum. There are no hidden fees, no subscription fees. Once you download the theme, it totally belongs to you. 4. -$175 in Advertising Credits. Fatcow understands it’s difficult to get your Newspaper Website visible and helps you with advertising your website on respective search engines and social networking platforms. So Fatcow gives you for free $100 in Google Adwords credits, $50 in Facebook Ad credits and $25 in Yahoo/Bing Adcenter credits. So basically your startup cost will be nothing for the first year. I think this is a great deal! Overall this is a great Responsive WordPress Theme for fashion bloggers, news bloggers, techie bloggers and just normal bloggers like me. This is definitely a very professional looking blogging WordPress Theme that is perfect for any purpose. I love that this theme has a scrolling featured bar where you can display 3 images or videos at a time to click. The ratings numbers is a cool thing to have as well and also the unlimited categories. From the demo, you can also see that you can display images from featured articles from various categories. I definitely recommend this theme. Click here for the recommended Fatcow Webhosting. Cost to create your own game review website is less than $100. Below I will show you the cost breakdown so it’s clear. Even if the price is low, your website will have tons of features ad will look very professional. 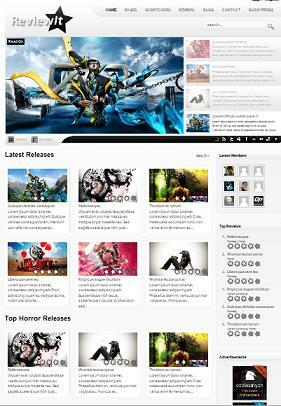 To create your Review website you will use WordPress and a WordPress Theme called IndiGamer. This Review template has a sliding featured image on the front page, GD star rating system, responsive layout, display top rated reviews, multiple layouts and more. 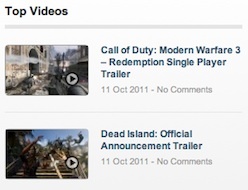 You can create your own gaming review website very easily. 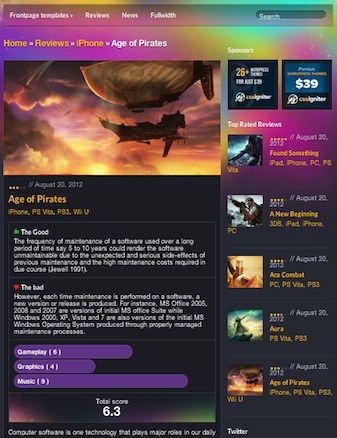 Click here for all the features of IndiGamer Review Template. 1. $56 for Webhosting. First step to create a website is to purchase a domain name. But nowadays you can get the domain name and web hosting together to save some costs. If you purchase web hosting from Fatcow.com, you get a free domain name, unlimited emails, unlimited bandwidth, unlimited MySQL databases and more. Right now Fatcow has a 40% off sale, I would take advantage of this now. Click here for more details about Fatcow.com. 3. $39 for Wordpress Theme. This is a one time fee to join the membership program at CSSigniter. You will have access to download as many these as you want while you have the membership. After the membership is over, the themes you downloaded belong to you. There are no extra or hidden fees. 4. -$175 in Advertising Credits. Fatcow understands it’s difficult to get your Website visible and helps you with advertising your website on respective search engines and social networking platforms. So Fatcow gives you for free $100 in Google Adwords credits, $50 in Facebook Ad credits and $25 in Yahoo/Bing Adcenter credits. So basically it will cost you nothing to startup your own Review website with WordPress. Overall this is a great template if you want to write reviews for movies, games, books, shoes, electronics and more. I especially love the “The Good” and “The Bad” page. I haven’t seen a review template that has those features along with a Total Score. These features are unique to this WordPress Theme. Check out the demo and try it out. WordPress Review Themes and WordPress Review plugins are a great way to allow users to leave comments and reviews on your website. Allowing users to leave reviews is also a great way to engage your visitors. 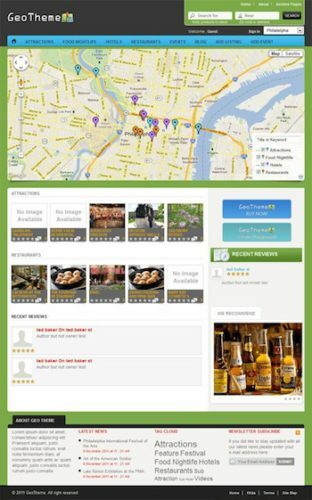 You can great a review website for restaurants, a review website for games, review website for movies, review website for software, review website for computers, or any type of review website you want to create. Below I’ve listed 11 WordPress Review Themes and WordPress Review plugins. Create a full-fledged Review site, provide your own ratings and get ratings from your visitors as well. Reviews is a visually stunning WordPress theme; ideal for enthusiasts to review movies, books, movies, restaurants, software, products, cameras and provide ratings to them. This WordPress Review theme also has amazing set of short codes and scrolling featured post on the frontpage. Click here to see more features of Reviews. 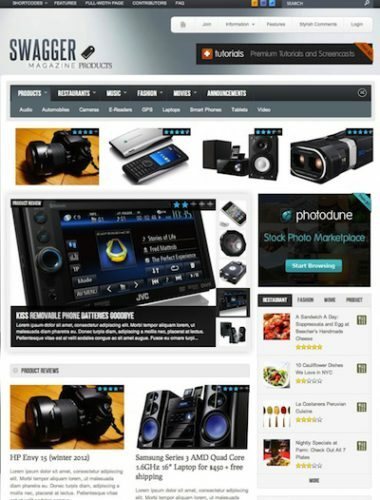 Swagmag is a premium WordPress Review theme in magazine style format. This WordPress theme, also called Swagger, allows you to create unlimited custom reviews within your main website . Swagger’s front page will grab content from your mini-sites and display it all together in an awesome, content-rich page to give your users the best user experience possible. Swagger is guaranteed to increase both the average length of time that your users spend on your site and the average number of pages that they view. Click here to see more features of SwagMag. InReview is an advanced WordPress Review Theme that allows you to transform your WordPress blog into a fully-functional review and ratings website. 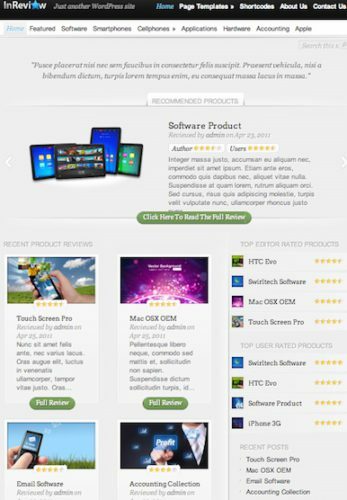 The theme makes rating products easy with our custom options and integrated user-review system. You can easily create a review website for gaming, movies, products, restaurants, photos, software and more. Click here to see more features of InReview. My Review Plugin is a WordPress Plugin. Allow users to easily add rate products, posts and contribute their own reviews through your comment box. Or you can allow users to see ratings as specified by the editor. Change rating types. Letter grades, percentage (out of 100), pass/fail and 10-star ratings are all available with just a click of a mouse. Show and compare information such as price, technical requirements, file size, sizes, etc. in the custom data comparison table. You can display this in a horizontal or vertical comparison table. 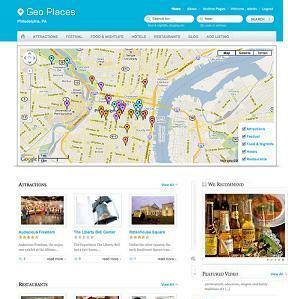 Easily embed accurate, navigatable Google Maps, 8 themes and so much more. Click here to see all the features available in My Review Plugin. Reviewit is a BuddyPress WordPress Theme that allows you to create a community based Social Media website like Facebook which will also incorporate a review structure. In addition to the BuddyPress social media template features such as creating groups, allowing users to communicate with each other, creating forums etc, the advanced review system uses GD Star Rating Plugin. Easily create a website for movie reviews, game reviews, software reviews, product reviews, shoe reviews, review on anything you want. Click here to see more features of Reviewit. 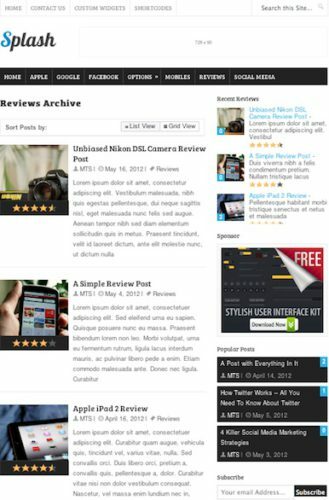 The Review is a WordPress Review Theme. This WordPress theme has 5 background patterns, 2 layout options, unlimited colour options, the 5 star rating and more. 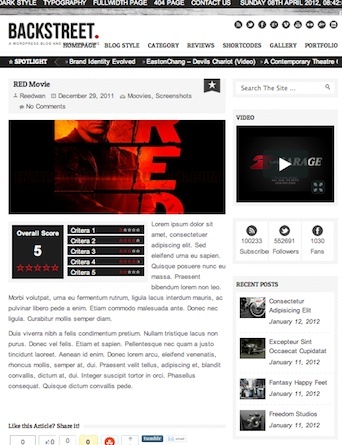 This theme is built to create a review site for movies, rating review site for tv shows and more. Click here to see more features of The Reviewer. Score is a BuddyPress WordPress Review theme. You can easily create a social networking platform using the BuddyPress platform and combined with the review system create an amazing review website. 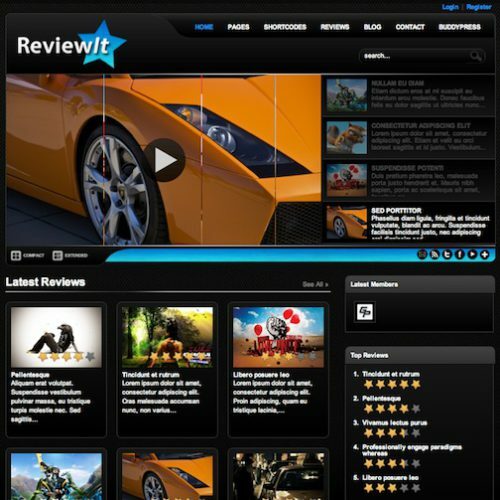 You can easily create a gaming review site, movie review site, software review site and more. This theme features a news ticker, slider featured articles, social media integrated, easily create interest groups, create interest forums, sort posts by rating, easily upload pictures, GD Star Rating Plugin and more. This is a great WordPress Review theme. Click here to see more features of Score. 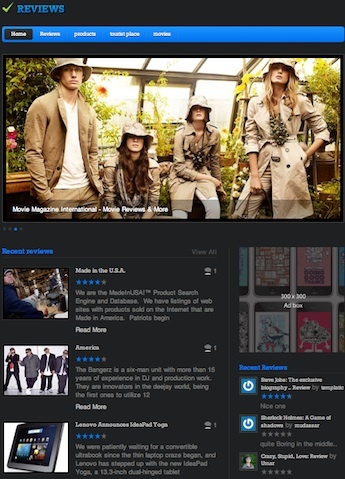 Avenue is a feature-rich WordPress magazine theme and is suitable for almost any niche. The theme comes with an inbuilt review system and 3 post formats (videos, audio & galleries). The homepage layout is very flexible, you can built your own layout using the 3 homepage widgets. You can also easily change the skin so it fits your needs. 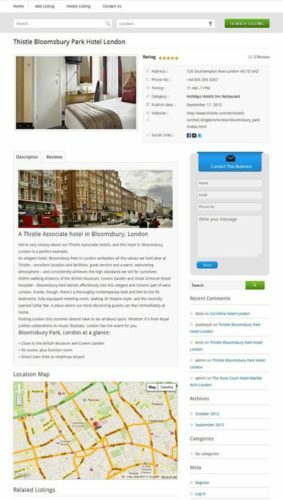 Click here to demo Avenue WordPress Review Theme. 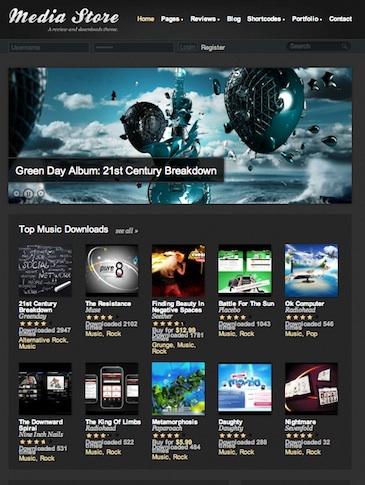 Media Store is a WordPress review and online store theme that is ideal to create a website like iTunes. Users can purchase and download files from your commerce website and also post comments and reviews on products. The WordPress Theme features a sliding featured image, display top music purchases/downloads, top rated movies, staff picked movies or songs and etc. Click here to see more features of Media Store. Backstreet is a modern WordPress magazine, portfolio and blog theme. With the 3 post formats (videos, audio & galleries) Backstreet can be used for almost any niche. Backstreet also built-in review system (with up to 5 rating criteria). Furthermore you can customize the look of the site easily via the custom theme options panel. Click here to see more features of Backstreet. 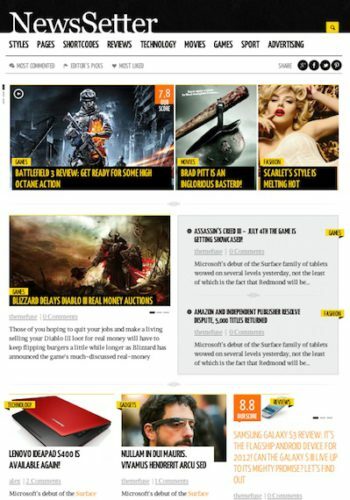 LeetPress is a WordPress theme with all the features you need to create a great gaming website, such as reviews, videos and screenshots. LeetPress also comes with 7 other help videos that will guide you through the theme. This WordPress theme has a sliding featured image, full width image slider, 4 different colour themes/skins, slick rating effect and more. 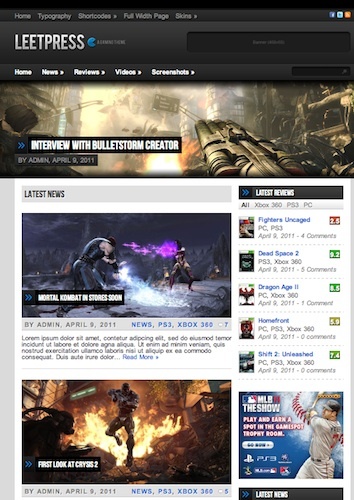 Click here to see more features of WordPress Game Review Theme – LeetPress. The above is a collection of WordPress Themes and a Plugin that I found were suitable to create a Rating and Reviews website. 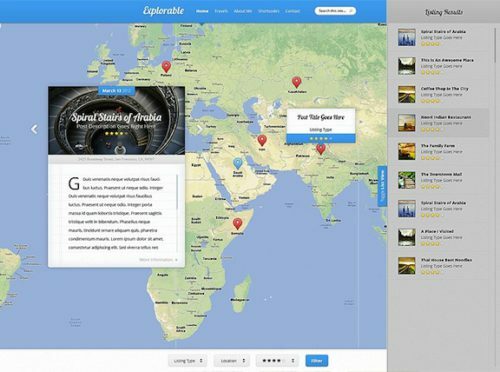 These themes and the plugin is great to create your own website for movies, games, software, products, restaurants, shoes, travels, food, baking, anything you want to write a review for. If there were 2 to pick from this list, I would definitely look into the WordPress Plugin – My Review Plugin and the WordPress Theme – Swagmag. Actually they are all good and any of them can be perfect for different purposes. 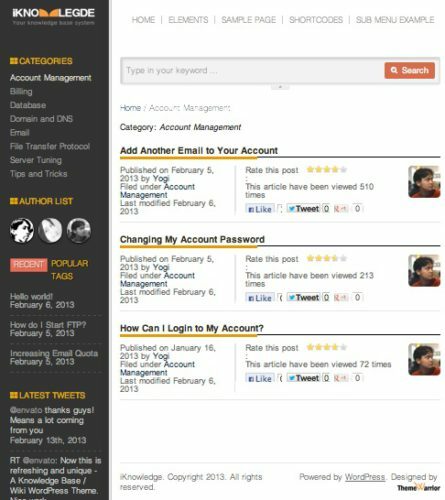 You can create a social networking website with review and ratings functionality easily with Score BuddyPress Theme. BuddyPress itself has all the social networking functionality, but this theme brings out the Reviews and Ratings and makes this a great community website. This theme will make your website look professional, fun and easy to use. There are tons of features in this BuddyPress/WordPress theme. Click here to see features of Score. Cost to create your own Review website with Score will cost you less than $100. It’s very simple to use and easy to install. Seriously, no HTML or web programming knowledge is required. See cost breakdown below. 1. $56 for Web hosting. You need to purchase a domain name to have a website. That’s why I recommend Fatcow.com. WithFatcow.com you get a free domain name, unlimited storage, unlimited bandwidth, host unlimited domains, unlimited MySQL dbs and more. Currently Fatcow.com has 40% off sale which makes this a great deal. 2. $0 for WordPress/BuddyPress. Wordpress is completely free open source and so is BuddyPress. You can find both at WordPress.org or BuddyPress.org. Fatcow.com also offers free one click installs which you can install WordPress in 5 minutes. 3. $40 for WordPress/BuddyPress Theme. This is a one time fee to purchase the Score BuddyPress theme. There are no membership fees, no subscription fees, no reoccurring fees and no hidden fees. After you purchase the theme it totally belongs to you. 4. -$150 in Advertising Credits. Fatcow.com web hosting gives you free Advertising credits to market your website in search engines. You get $75 in Google Adword credits, $50 in Facebook Ad credits and $25 in Yahoo/Bing Adcenter credits. This is totally free to you. ( Startup costs + Advertising Credits) = -$54. So you actually don’t pay anything to startup your Social Networking Review Website. This is an awesome deal to create such a professional website. The best thing is that there are tons of support from the WordPress/Buddypress theme community and also from Themeforest. If you have problems, you can just post a question on the forum and someone will answer you. Create your own review website for any type niche market. 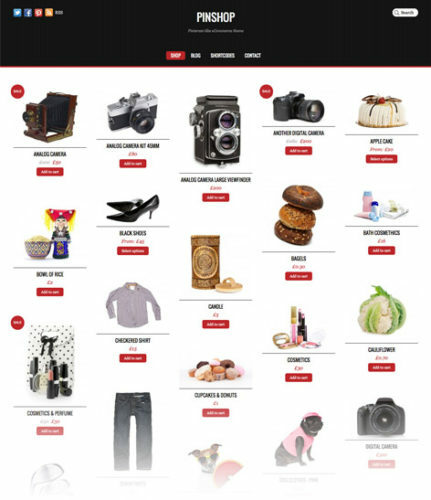 Some niches you can focus to create a review website with this WordPress BuddyPress theme are movies, games, music, computer hardware, computer software, photos, restaurants, hot spots, vacation destinations and so much more. Creating your website with the Buddypress Theme requires NO html or programming knowledge. Once you install the theme it is a fully functional review website. Click here to see all the features of Score. Show active users – Increase community posting by displaying the user who contributed the most to the review website. Overall this is a comprehensive WordPress BuddyPress theme overflowing with features and functionality. With BuddyPress it’s the easiest way to create your own social networking website and also transform it into a community review and ratings website. 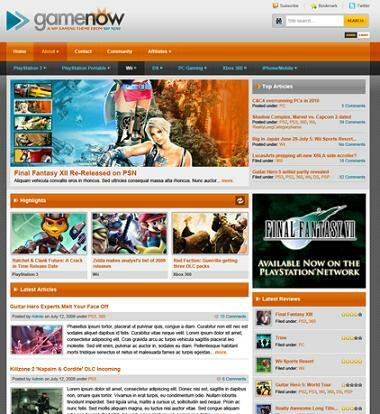 GameNow is a premium WordPress Theme designed to transform your website into a game review site. The theme is extremely powerful and customizable. 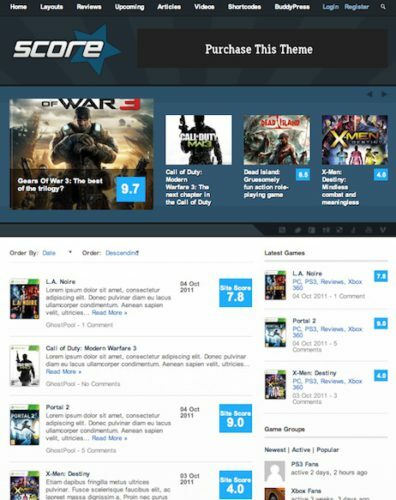 All design elements highlight and showcase your best games and best game reviews. The theme is also integrated with 5 star rating system. All this, and you don’t need to touch one piece of HTML or PHP. The best is that the startup cost to build your game review site is extremely low. It will cost you less than $100 to set this website up. I detailed the cost breakdown below. 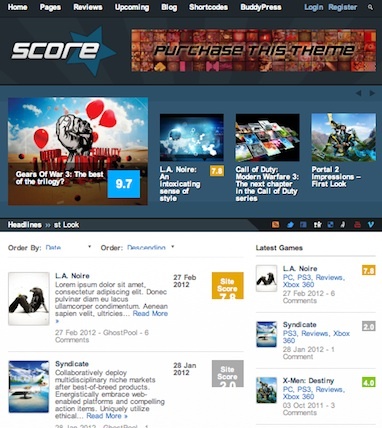 See more features of the GameNow Theme. 1. $56 for Webhosting. You need to purchase a domain name to start a website. That’s why I recommend to purchase webhosting from Fatcow.com. With purchase of webhosting you get a free domain name. You also get unlmited disk space, bandwidth, email address, MySQL databases, host unlimited domains and more. Currently Fatcow.com is 40% off that’s why there is such a deep savings. Click here to get more details about Fatcow.com. 2. $0 for WordPress. WordPress is completely open source and free to anyone. You can go to WordPress.org to download and play around with it. 3. 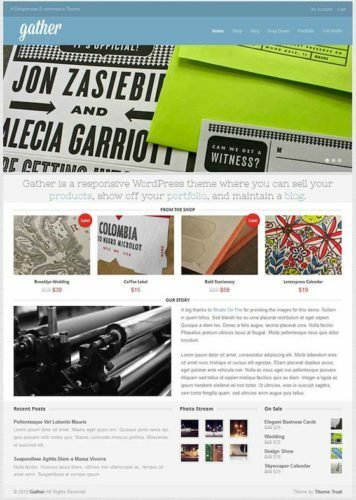 $49 for WordPress Theme. This is a one time fee to purchase the template. There are no hidden costs or subscription fees. After you purchase the template, it totally belongs to you. If you purchase template from WPNow, you buy one get another template for free. 5. -$150 in Advertising Credits. Fatcow.com gives you free advertising credits if you purchase webhosting from them. This includes $75 for Google Adwords, $50 for Facebook Ads, and $25 for Yahoo/Bing Adcenter. So if you add up everything, the total startup cost to create a Gamefly clone is (Webhosting + WordPress + WordPress theme) = $105. If you include the free Advertising credits from Fatcow.com, (Startup cost + Advertising credits) = -$45. So you actually pay nothing to get your Game review website started. This is a great deal and definitely highly recommended. As mentioned in my previous post, this WordPress Theme will transform your website into an amazing video blogging website or a website like Youtube or MetaCafe. This is the most efficient way to host your own video repository and it will not cost a fortune either. It will cost you less than $200 and probably an hour to get your website up and running. Below I’ve listed the costs involved to get your YouTube clone website started. Click here for more details about MoviePress. Automatically creates thumbnail when video is uploaded. Click here for a demo of MoviePress. 1. $56 for Webhosting. You need to purchase a webhosting and domain name to get your website started. I recommend webhosting Fatcow.com because with purchase you also get a free domain name. You also get unlimited bandwidth, disk space, MYSQL databases, host unlimited domains and much more. Currently Fatcow.com has 40% off sale, click here for more details. 2. $0 for WordPress. WordPress is completely free. You can download WordPress to try out at WordPress.org. 3. 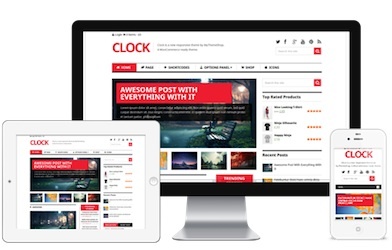 $79 for WordPress Theme. This is a one time fee to purchase MoviePress from PremiumPress. They have unlimited support and unlimited updates. You can install this theme on as many websites as you want. There are no hidden fees. 4. -$150 Advertising Credits. If you purchase your webhosting from Fatcow.com, they give you $150 in free advertising credits – $75 for Google adwords, $50 for Facebook ads, $25 for Yahoo/Bing Adcenter. So if you add up all the costs together: (Webhosting + WordPress + WordPress Theme) = $135 to get your website started. If you calculate in the free advertising credits you also get (Webhosting startup cost + Advertising credits) = -$15. You actually setup your YouTube Clone website for free!! If you are from outside of Canada/US – please see my recommended webhosting page. I have a coupon if you want to use dreamhost. If you need help to create your Youtube website with MoviePress, contact me for a quote. 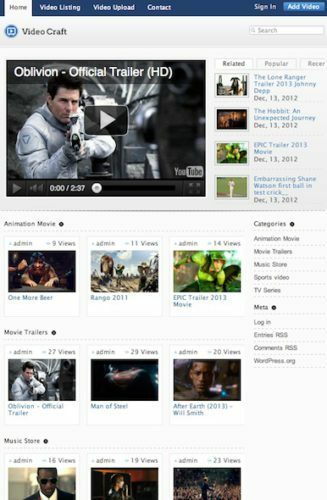 IMDB Template – Movie review websites like imdb or Rotten Tomatoes are popular. 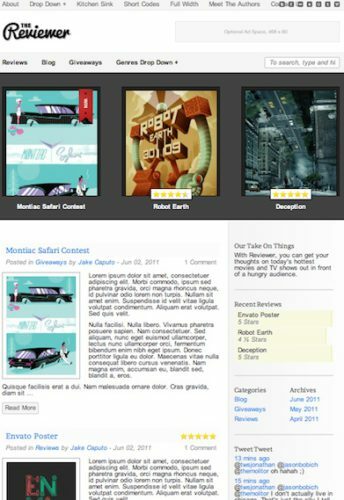 If you want to create your own movie review website it’s quite simple using WordPress. After you install WordPress, install and activate a premium WordPress theme and voila, you have a movie review site. WordPress is very powerful, it is a blogging software but it has a MYSQL database backend. The frontend WordPress administrator panel controls everything about your site and you don’t have to touch a single piece of code. See below the cost to create a movie review website like imdb or a site like Rotten Tomatoes. Click here to see more features of Review it Movie Review Template. Users can login and rate movies, leave comments about the reviews. Users can manage their own profile, view activities of friends, groups or people tagged as favourites. Members can also leave comments for other members. Different color schemes – Dark and Light. Star based review system that members use to rate the movies/games/software. Straight out of the box installation. 1. $56/year Webhosting. You need to purchase web hosting and a domain name. I recommend Fatcow.com because with the purchase of your web hosting they also give you a free domain name. This also includes unlimited disk space, unlimited MYSQL databases, unlimited email addresses, unlimited bandwidth, 24×7 support, and much more. Currently Fatcow.com has a 40% off sale, so I don’t know how long this price will last. See details here. 2. $0 for WordPress. WordPress is completely free and open source. You can read or play more with WordPress at wordpress.org. 3. $35 for WordPress Theme. This is the price for the Review It Theme. This is a one time fee to purchase the theme and afterwards it belongs to you. No need to pay any reoccurring fees. This theme is great because it also includes BuddyPress (community building software). Users can login and rate movies, leave comments about the movie reviews, manage own profile, view own posting activity or view activities of friends, groups or people tagged as favourites. Members can also leave comments for other members. It’s almost like building your own facebook movie fan pages. Demo the theme here. 4. $150 Advertising Credits. If you purchase your webhosting from Fatcow.com you will also get $75 for Google adwords credits, $50 Facebook advertising credits, $25 Bing/Yahoo advertising credits and also list your business on YP.com (Yellowpages) for free. They give all this to you for free. So if you add in all your costs (Webhosting + WordPress + WordPress Theme) is about $91. I say approximately because prices are subject to change and the webhosting is on sale. If you include the advertising credits you get to spend at Google adwords, Facebook and Bing, you actually pay nothing. You get back your money through the credits. This is the perfect imdb template or movie reviews template. Click here to demo/download Review It – Premium WordPress Theme. Click here to Take advantage of the 40% sale at Fatcow.com.